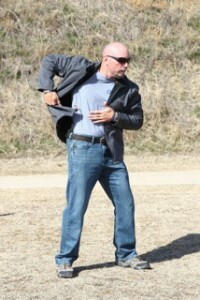 The Concealed Carry Association of NC would like to introduce our partner, Mike Seeklander. Mike is owner of Shooting-Performance LLC (www.shooting-performance.com), a full service training company. He is also the co-host of The Best Defense, the Outdoor channels leading firearm instructional show as well as Rapid Fire. Mike is the current IPDA BUG (Back up Gun) national champion and winner of the 2011 Steel Challenge World Speed Shooting Championships. In addition to being a great shooter, Mike has more than 15 years of experience in various martial arts holding a Black Belt in Okinawan Freestyle Karate. Mike is a highly sought after tactical and competitive trainer and a high level performer on the competition handgun circuit. Mike still remembers how excited he was to get his first concealed carry permit. He and his best friend took the course, got their carry cards, and immediately starting carrying on a daily basis. They took the responsibility seriously, and as a result began to train as often as possible. As the years progressed, Mike found himself really dedicated to his new love, the sport of practical shooting. 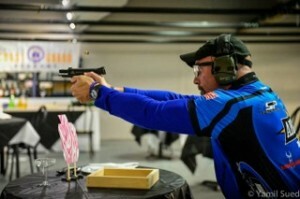 In 1998, Mike was hired full time by the Knoxville Police Department, began shooting at the Master level competitively, and practicing as much as he could on the range. Like many, Mike’s life changed course on Sept 11, 2001 when terrorists flew several hijacked airplanes into the World Trade Center and Pentagon. Shortly after 9-11, he was recruited to attend a weeklong training class with the Army Marksmanship Unit in Michigan taught by the famous Jerry the “Burner” Barnhart. During the class Jerry mentioned the Federal Air Marshals (FAMS) were looking for firearm instructors. It was there that Mike would meet many instructor mentors and train with elite operators from the military and federal government. He would eventually get the opportunity to run the entire firearms training section as the Branch Chief and Lead Instructor for the Firearms division with the Federal Air Marshal Service as well as a Senior Instructor at the Federal Law Enforcement Training Center (FLETC). Mike has since worked as the Chief Operating Officer, Director of Training and a Senior Instructor at the U.S. Shooting Academy in Tulsa, Ok. The exposure to this arena convinced Mike that his true love and passion is instruction. He feels there is nothing more satisfying than guiding someone along a path that allows them to improve their skills. We are thrilled at the CCA o f NC to have Mike join us. Mike’s videos, articles, and direction are intended to get our members to seek out additional training. 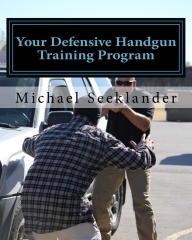 As part of our “Ask the Pro’s” Mike will serve as an objective resource you can use when you have questions concerning concealed carry or shooting techniques for use with your students. Mike also plans to coordinate our training development and work to create exclusive advanced items for our instructors specific to our members needs. He has also graciously agreed to share videos from his personal library as well as offer his full line of products at exclusive discounts to our members and instructors.